NEW OREANS — Recently released documents show the federal government knew as early as July 2004 that if a Category 3 hurricane were to hit this region, widespread devastation would ensue. Yet when Hurricane Katrina, a Category 4 storm, made landfall on Aug. 29, the government’s response was flatfooted and negligent. But these and similar warnings, some going back years, went unheeded. No effective emergency plans had been put in place. The Federal Emergency Management Agency (FEMA), despite President Bush’s praise for then-director Michael D. Brown, failed miserably. The results are well known. Besides exposing government negligence and bungling, Hurricane Katrina awakened the nation and the world to the centuries of endemic racism and callous treatment of the poor and dispossessed in the United States. Storm victims were stranded for days on end. Many were treated like criminals. The myth that the U.S. is a country where milk and honey flows in the streets, where everyone has an opportunity to lead a prosperous life, was starkly exposed as the world saw thousands of desperate, mainly Black and poor, residents of New Orleans scrambling to survive in the wake of the storm. Today, six months after the disaster, 2 million people are still displaced. Over 3,200 are still missing. During my December visit, conditions in New Orleans were disheartening to see. Mile after mile of curbsides were strewn with refrigerators, television sets, water heaters and debris piled several feet high. Thousands of waterlogged cars still sat in the driveways of homes. Whole neighborhoods were (and still are) without electricity. Houses, apartment buildings and businesses were mold-infested. There were no supermarkets or gas stations open. A few mom and pop stores with inflated prices served the small population that remained. Price gouging was (and still is) rampant in rental properties. New Orleans Mayor Ray Nagin has beseeched residents to return to the city, despite the fact there are no places to live and no services. Thousands of trailers that were purchased for temporary housing are sitting in storage in Tennessee, undistributed because the local politicians and special interests groups are refusing permits for their placement in and around the city. This housing would enable some of the displaced to return to oversee the cleanup of their property and begin to resettle their lives. Opportunistic cleanup, construction and mold-removal companies have peppered most of the open spaces with advertising signs, hoping to take advantage of beleaguered homeowners. Some of these contractors, most of whom are based outside the city, have looted personal belongings and stolen precious glass and woodwork from the properties they are working on. The environment has been severely compromised. Arsenic, diesel fuel, pesticides, lead and other contaminants pollute the soil in many of the city’s wards. The health and safety of the returning residents has been a little-discussed question. Nagin’s administration laid off all of the public school system’s employees and declared that the only future schools in New Orleans would be charter or private schools. Only one charter school is open, six months after the flood. George W. Bush continues to spend billions on the imperialist occupation of Iraq, yet he won’t support legislation that would bring desperately needed relief to the Gulf Coast. One such bill is the Congressional Black Caucus’ HR 4197, which would fully restore the Gulf Coast region through employment, education and housing programs, and reunite the dislocated families. Another is a bill introduced by Rep. Richard H. Baker (R-La.) to create a “federally financed reconstruction program … that will bail out home owners and mortgage owners in New Orleans.” At the White House, such proposals fall on deaf ears. The survivors feel neglected and besieged by incompetent and callous policies that have been initiated at all levels of government as well as by many of the organizations that are purporting to assist the displaced. They are particularly furious with the incompetent, insensitive and unprofessional treatment they received from FEMA. The agency has declared that Feb. 28 will be the last day it will fund any hotel rooms for those still displaced, regardless of whether they have a place to move to. Jumping ahead of this deadline, some hotels in New Orleans have begun evicting residents to prepare for Mardi Gras season. FEMA mismanaged the distribution of funds, food and materials. Those survivors who were the neediest were underserved or never served. FEMA has issued a string of inconsistent directives and policies that become impossible to follow and tend to destabilize the survivors by keeping them on an emotional roller coaster. And it’s not only FEMA. The American Red Cross has also fallen short, survivors say. Its approach has been all too similar to FEMA’s: providing aid to areas that were not so hard-hit, while ignoring or under serving those most in need. For decades, various politicians and big land developers have had a vision to gentrify New Orleans by expanding the French Quarter, developing a corridor for the wealthy and introducing gambling casinos. In this predominantly African American city, such a plan would mean displacing tens of thousands of Black households. The Katrina catastrophe provided convenient circumstances for this plan to be implemented. To further this scheme, communities that had minimum water damage were declared uninhabitable. Whole neighborhoods were designated for demolition, with or without the owner being notified. Insurance companies have refused to honor some homeowner and flood insurance policies. Mortgage companies insisted on payments for homes that were totally ravaged. There has been a concerted effort on the part of land developers and investors to pressure the residents to sell cheaply so they can gobble up massive amounts of land and property. As a consequence, professor John R. Logan of Brown University estimates that 80 percent of the African American population of New Orleans may never return. This would dramatically change the racial and class character of the city from Black and working-class to white and well-to-do. It would also likely change its political character from predominantly Democratic to Republican. The displaced community has had some limited successes in fighting for their rights. They won the right to be notified, with the right to appeal, before their home is demolished. They were able to get a brief extension, from December to February, on their FEMA-paid housing. The People’s Hurricane Relief Fund and Oversight Coalition (PHRF) convened a conference of survivors and their supporters Dec. 8-10 to discuss the racist approach the government and its agencies took toward survivors, and how the lackadaisical response led to days of misery, starvation and death. Approximately 500 people attended the gathering. About one-third were evacuees who were returning to New Orleans for the first time since the hurricane. Some were victims of the devastation in Mississippi. • Provide funds for all displaced families to be united. • Allocate the $50 billion for reconstruction to the victims of the hurricane in the form of a Victims Compensation Fund. • Accept representation of survivors on all boards that are making decisions on spending public dollars for relief and reconstruction. • Place displaced workers and residents in New Orleans and the Gulf Coast in public works jobs, offering union wages. • Publicly account for and show the entire reconstruction progress. In addition to backing the PHRF proposals, supporters should write and lobby their congresspersons to extend the FEMA housing allotment, to support the Congressional Black Caucus’ proposals, and above all to support the right of residents to return. Letters to the editor will help keep this issue of survival before the whole country. Debbie A. 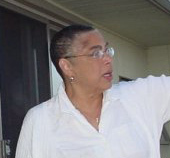 Bell is chair of the Communist Party USA’s African American Equality Commission. Bill Davis and Sheltreese McCoy contributed to this story. Debbie A. Bell, who died in 2017, was a longtime freedom fighter and Communist Party member who went to jail in the deep South fighting for civil rights alongside her good friend Julian Bond. She became a teacher, union and Party leader in Philadelphia. A working class intellectual and community leader she was a model of commitment and courage during the most difficult days.